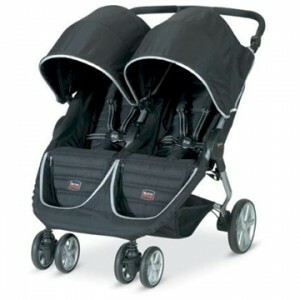 For the first time every, Britax will be releasing a side by side double stroller. Britax plans for the stroller to be a continuation of it’s relatively new ‘B’ series which now includes the B-Nimble umbrella stroller, B-Agile lightweight stroller, B-Ready full size stroller, and the B-Safe infant car seat. The stroller will be a double version of the B-Agile stroller which is almost an exact copy of Baby Jogger’s wildly popular City Mini stroller. For the most part customers are very happy with the single B-Agile stroller but many parents are still split on whether they prefer the B-Agile or the City Mini. There are definite advantages to both but they are actually very similar and both have great overall feedback. Some of the differences include materials, wheels size, and car seat options. City Mini has more rugged textiles including a rubber handle that is 1.5″ taller than Britax’s foam handle and tough nylon fabric that easily wipes clean. Britax’s B-Agile features a softer nylon material and also has a microfiber head support. Some parents really appreciate the extra padding but personally I find it more convenient to have a stroller that is a little tougher and easier to clean. Wheel wise, the B-Agile has bigger back wheels and smaller double front wheel and the City Mini has smaller back wheels but a bigger double front wheel. As a travel system, Britax wins between the two since you don’t have to use an adapter if you have a Britax infant seat, just click it in and you’re good to go! Though the easy fold is the big draw for both these strollers, each company has a singular advantage with it’s individual fold. With the City Mini you can simply pick up the strap and the stroller folds, there is no additional lock release to push. However, the Britax locks automatically which is a huge plus and very helpful for parents who have a lot to carry around and handle at one time. B-Agile’s double version will also have an adjustable handle which their single version does not have. At the end of the day, Britax copied the City Mini which seems a bit like cheating but they did make some improvements and a little competition can never really hurt. If you are a taller parent or you have a family that needs a stronger stroller then go with the City Mini. Parents who are just looking to supplement a full size stroller and need something lightweight and comfortable should choose the B-Agile.